Tourism Ireland has launched a conference CO2 calculator app for event organisers. 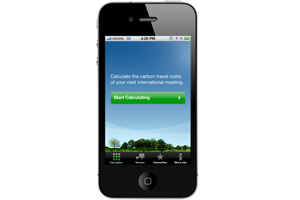 The free app for the iPhone will enable organisers to check the carbon emissions associated with international delegate travel and offers tips on hosting greener meetings. Users can specify unlimited delegate departure locations, compare the CO2 emissions associated with air travel to three international destinations at a time, and evaluate their chosen event or meeting destination with travel to Dublin. Users are also able to view special offers directly from venues and hotels in Dublin, with the section expanding to other Irish locations over the coming months. The launch of the app coincides with the opening of the Convention Centre Dublin (CCD), the world’s first carbon neutral international convention centre. David Boyce, deputy director Great Britain at Tourism Ireland said: "One of the main reasons delegates choose to come to Ireland is its green credentials. This app helps organisers assess their conference or event on its CO2 emissions. The iPhone app, coupled with the opening of the CCD further underlines the destination’s commitment to green and we hope this encourages more people to choose Ireland for their event".